When thinking of ambient black metal bands that have had perceptible influence on the genre and the metal world, the list is rather short. I have another list, of metal albums I take with me if I expect to be bereft of access to the Internet, which is also (by necessity, alas), very short. These lists have at least one thing in common: Summoning's 1995 masterpiece, Minas Morgul, is on both. 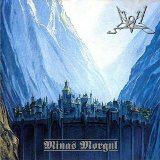 There were hints of influences from prior black metal works that went into Minas Morgul, but not only was it unique when it first appeared, it's stood the test of time as an influence on black metal in general that never receded, defining Summoning's future sound and the sound of many followers. Prior to Minas Morgul, the band had released a more traditional (and still excellent) black metal album, but after splitting with their drummer, remaining collaborators Silenius and Protector created a completely different sound. Minas Morgul's sonic world is one of huge, echoing drums, majestically layered orchestral keyboard overlays, and a combination of high, thin tremolo guitar picking with keyboard-based horns that sound like the duo bought them from an Eldar Army Surplus store. After a quiet intro (which has always been another of their trademarks), Lugburz starts with the aforementioned sound, slow and plodding to the rasp of harsh vocals until the middle of the track. There is still a lot of black metal influence on this track, from the high-speed drumming in the middle to the ever-present tremolo picking, but the backing keyboard is a sign that this is about to change. The Passing of the Grey Company, still slow but steady-paced, has high, whining keyboard flutes in a military march contrasting with the deep crash of the distant-sounding drums -- which isn't a coincidence, as the song quite literally describes a death march, to an ancient meeting-place to raise up an army of ghosts. The scene continues in Morthond, which starts softly with keyboards, then builds up to a hammering beat reminiscent of the battle being described in the lyrics. Almost none of the breakneck speed of typical black metal can be found on here, and the whole feeling of the album is different, almost more like a soundtrack than a metal album. The hypothetical movie that goes with the soundtrack is from the works of J.R.R. Tolkien (they would have been a much better, if perhaps more brutal, choice for the Lord of the Rings movies than Enya). All the lyrics are from or about his works, which later became a Summoning trademark, though you won't find a whole lot of happy or idyllic scenes -- no stays in the Shire or the house of Tom Bombadil for these two. The darker portions of Tolkien's world -- nasty places like Mordor and Dol Guldur, disasters for the good guys like the Battle of Sudden Flame, and monsters such as Ungoliant are what Summoning prefers to dwell on. Throughout the album, even the darkest images are depicted in such a powerful way (especially for those who have read the books) that fierce, yet sorrowful funeral marches such as Marching Homewards have real beauty. The lyrics are mostly Tolkien's, but mixed in with the band's own interpretation and additions, which makes it even darker and more poetic in places, such as Ungolianth, with the lyrics from the point of view of Morgoth (who is basically Satan, in Tolkien's fantasy world, making him an ideal subject for a black metal band). Orthanc is completely different as an instrumental from the marching pieces; high, thin keyboard synths overlay electronic bass and mechanical drumming, while Dagor Bragolach is a pensive, nervous, stopped/started piece that jerkily winds its way around the harshly croaked vocals and battle horns. The last three tracks are in many ways my favorites. The first two aren't quite as dark; Through the Forest of Dol Guldur has a positive-sounding melodic hook and an even more cinematic sound, led by the tremolo guitar work and accompanied by a thundering drum, while The Legend of the Master-Ring has the guitar staying mostly in the background, with the keyboard performing most of its ringing piano melody; but if one listens carefully to that background, interesting features can be spotted in the combination of the picking rhythm against the beat. But the last, truly epic piece is Dor Daedeloth. Even more bombastic than the tracks before it, it starts with slow keyboards, but as the song evolves, it changes melody like a play in several acts, from soft, to thunderously dramatic, to a final, newly despairing marching song fading out as the album ends. Minas Morgul became the first in a line of similarly-themed albums from Summoning, all excellent. It also has completely validated, for better or for worse, the use of the keyboard as a primary instrument in black metal and allowed future bands to further extend the ambient side of black metal. Without overstating it, Minas Morgul sent the high-speed guitar, double-kick drums, and shrieked lyrics traditional in black metal into a more thoughtful, picturesque sonic palette describing an entire world -- a technique that predecessors like Bathory and Burzum had explored a little -- without discarding anything truly meaningful about black metal as a genre. Not every metal devotee feels the same way about Summoning or ambient black metal that I do; it's one of those bands one often either gets or hates immediately. But it can't be denied that their first album with the signature Summoning sound was a milestone in black metal that continues to be a delight to hear after almost twenty years.